Philippine Savings Bank (PSBank), the retail banking arm of the Metrobank Group, treated its clients to a fun-filled and entertaining night at the Rockwell Cinema last June 14. Close to 200 guests were ushered in the cinema to enjoy the fifth installment of Steven Spielberg’s Jurassic Park science fiction adventure film series – Jurassic World: Fallen Kingdom. The guests were given a loot bag, FREE popcorn, hotdog sandwiches and drinks. This is the first of a series of customer engagement events that the Bank has laid out relating to its #SimplengThankYou campaign for its clients this year. Taking the lead in welcoming the guests were PSBank Senior Vice President and Marketing Group Head Emmanuel Tuazon, and First Vice President and Customer Experience Group Head Mary Jane Valero. “This is our small way of saying Thank You to our valued clients for the continuing support and trust they have given us over the years. It is also a way of reaffirming to them our commitment in delivering on our Simple Lang, Maaasahan brand promise,” said Mr. Tuazon. Also on hand to welcome the clients were PSBank Senior Vice President and IT Group Head Neil Estrellado, joined by representatives from the Customer Experience and Marketing Groups. To make the night more memorable, a promo and a raffle were held. 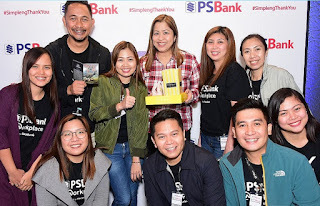 In the social media promo, guests were asked to take a selfie or groufie at the photo wall and share with their friends by posting their photos through their social media accounts, using the event’s official hashtag #PSBankSimplengTY. Three lucky clients were randomly selected in the promo while five clients won in the raffle draw. Each winner received a special token from PSBank.